Ieri sera sono andata al cinema a vedere il nuovo film di Tim Burton con Johnny Depp, Dark Shadow, e come sempre, quando c'è lui non vengo mai delusa dalle aspettative. Ma veniamo a noi, questo è il look scelto per la serata: abitino floreale di Oasap, ballerine in cuoio, borsa bauletto e giacca in pelle rossa. p.s non dimenticate di partecipare al giveaway, grazie al quale potrete vincere un paio di orecchini con teschi! Last night I went to the cinema to see the new movie by Tim Burton with Johnny Depp, Dark Shadow, and as always, when he's there, my expectations are never coming disappointed. But let us, this is the look chosen for the evening: Oasap floral dress, leather ballet shoes, trunk bag and a red leather jacket. p.s don't forget to participate to the giveaway, thanks to which you can win a pair of earrings with skulls! Oh, the dress is lovely and the flats look amazing! Love the outfit, the dress is so lovely!!! Che abitino sfizioso!!!! !Sta benissimo con la giacca!!! Che meraviglia, mi piace un sacco questo vestito! il vestitino è adorabile, ma la giacca di pelle rossa è splendida!! gracias por pasarte por mi blog! yo tambien te sigo. un beso. Adore your red leather jacket! What a cute outfit, I loveee the jacket! Bom dia querida Fabiana, que lindo seu vestido florido, ficou sensacional. Já lhe cadastrei lá nos meus blogs favoritos também (mevestiassimpara.blogspot.com.br). Bom final de semana. Great outfit and a lovely blog; I'm a new follower now as well. Mi piace il tuo blog.. ti seguo! Se ti va di ricambiare..
Hi! Thank you for the comment on my blog! I am not following you via GFC, number 1111. I consider that lucky. Very cute dress. Love oasap! Thanks for visiting my blog! Yes, I would love to follow each other.. following you now via GFC! :) Have a great day! What a perfect look for your date with Johnny! Great idea to follow each other! Following you now! Love the floral dress, so cute on you! I LOVE THE RED leather jacket! 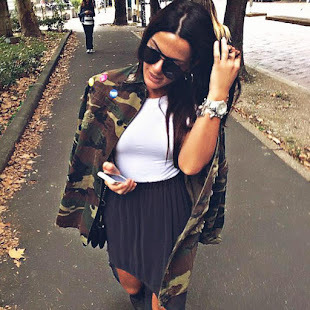 it looks amazing on you, your blog is such an inspiration, can we follow each other?? Very nice dress! I want a jacket like yours! Bellissimo abito, e va molto bene con la giacca. A me piace moltissimo Johnny Depp, é lo massimo! I am follow you on GFC, follow me too? I really love the red leather jacket against the floral dress, Fabiana. Thanks so much for stopping by my blog and commenting. Yes, let's definitely follow each other. wow! czerwona skóra to cudeńko! such a cute dress love it with that jacket! Love the red leather jacket! Thank you thats so sweetof you! Sure lets follow eachother, let me know when youve started and Ill do the same! Cool dress, love the colors. FIRST INTERNATIONAL GIVEAWAY on my blog! you look fabulous in red!! Gorgeous outfit - you're so pretty! Love the dress. I have to go to the cinema to watch the move with Johnny Depp too. Hello dear, thank you so much for your comment on my blog, you look so so lovely and feminim in this outfit! love those kind of dresses!!! You looks stunning! the floral dress looks so pretty but the jacket is definitely my weakness. Your outfit is very classi and chic! Love this feminine way of dressing! waow.. i should the latest johnny deep movie.. nice outfit for go to the cinema.. love your red jacket.. btw, sure we can follow each other.. i just followed you..
love your dress and bag... so gorgeous!! yes! thank you for following! I am dying to see that movie - anything with Johnny Depp is always perfection, and as is your outfit. That dress is stunning! Thanks for visiting my blog. Have a fantastic weekend! Love the dress, you look so pretty! Bellissimo film e bellissimo outfit! Se ti va passa dal nostro blog! Awesome dress! You look amazing! Thanks for the comment and yes I want to follow each other! I follow you on GFC and Facebook! Please follow me back! Nice dress and nice jacket too! These Cheap Leather Jackets are really awesome.as i am living in australia and i like bike riding i wish i could buy these leather jackets.Is here any possibility to buy these stuff..Kindly email me the procedure.